I installed them pretty much on the order I got them except if one of the mods especially stated that something should be installed before it. On graphics like new armors I went from least important to most important for me due to I knew that some of them would he overwritten. For load order I just use what ever BOSS throws out when you run it. Yeah, I didn't have too many issues with them. I did get rid of couple of mods like convenient horses and something else which were causing issues. Here's my current mod list for the stream. Everything on this list is included. The red x'd files are also installed. To install ALL the 2k textures at the same time you have to say NO on the popup that comes up once you try to install the second 2k texture and so on. They will still install. I just started playing Skyrim last monday on stream, and this list will just make it so much better! Great write up! I will definitely use this to try Skyrim once I upgrade my PC. You might also do a video showcase of just how much is the game changed with all these mods. However, my biggest problem with Skyrim was combat and enemies' level scaling - some enemies had way too much hp and you just had to bash on them until their hp slowly reached zero... Any mods that fix that? SkyRe is a gameplay overhaul that modifies weapon damage and armor values (if you use modded armor sets you also need to use the Reproccer), making combat much faster paced (both you and your enemies tend to hit harder). You can choose different modules to install, so if you only want the combat changes then you just choose that module. Actually, this mod does a very good job reorganizing the skill trees as well (for instance, 1h weapons are split into multiple groups, each with specific bonuses). There are also a couple of AI enhancement mods out there like Enemy AI Overhaul or Ultimate Combat. If you want to combine a bunch of texture packs, have you seen the Texture Pack Combiner? It is a tool that combines a whole bunch of different graphics mods (and you don't have to use them all). I'm going to have a stab at modding skyrim again, I'm going for a survival game this time, lore friendly* gameplay, item, creature, and immersion mods. 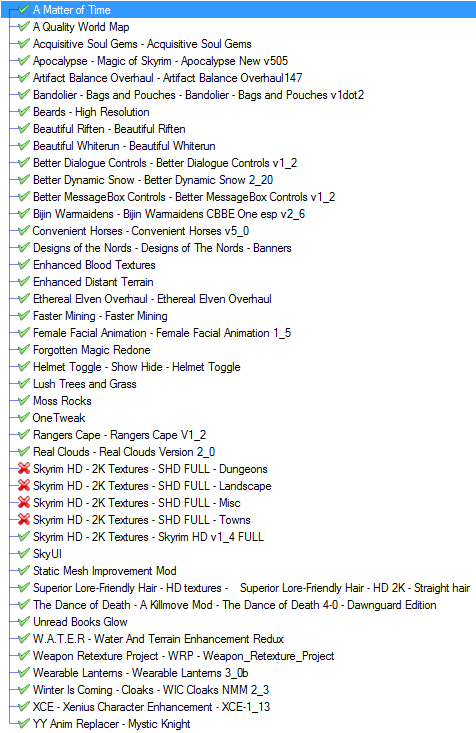 I'll be using Skyrim Mod Organizer this time (w/ LOOT), I'm going to use SkyProc patchers and a bashed patch. SKSE 1.7 will be used. Well, that's some list. I'm no expert when it comes to doing the bashed patch and running these SkyProc patches and patchers, though. Ok PCX64...that is quite the mod list. I hope you have a good rig for it and are prepared for the game to crash. I'm not familiar with all of the mods that you are planning to use, but it looks like you don't have too many that could conflict, and the ones you do are mostly sound mods. I would recommend getting the CTD and Memory Patch ENB (uses the performance fixes from the ENB without all the performance heavy graphics tweaks). In addition to the Bashed patch, I would recommend making a merged patch as well. Without the merged and bash patches with this number of mods, you will get conflicts and you will cause CTDs. Also, any reason you stayed away from Deadly Dragons? Edit: woops, didn't notice Deadly Dragons on there. Deadly Dragons is on the list - item 62. For example, I have a few mods that modify the GUI - SkyUI, iHUD, and that colored map markers mod. From what I've read, all three UI mods should be compatible with each other. Install order for these is unclear, though. Yeh, Me thinks I'm going to be spending a lot of time outside the game before I can start playing it, I'll have to know what to bash, what to merge, what to exclude from the various SkyProc patchers: ReProccer, ASIS, AV, and Lootification. Also, I'm going to need to find out what conflicts with what, which patches exist for which conflicts, and if I don't have a solution for it, perhaps create my own patch if it is not too much work. I'll be looking at alternative mods otherwise, but let's get started on something small - the sound mods. The only sound mods that I got on the list are these, If I didn't forget something. I might have sounds in other mods, I haven't completely checked all mods yet. I hope these three shouldn't conflict much... But let's have a look at the files anyway, beginning with the data files. Immersive Skyrim Thunder got only 12 files (all prefixed "amb_"), in two folders under sound/fx/amb/weather/, one folder named "rain", and one named "thunder". The Climates of Tamriel Sounds BSA contain only 39 files, in seven folders under sound/fx/ClimatesOfTamriel/. Shouldn't conflict I think... looks like new soundscapes. Audio Overhaul for Skyrim is the big one, here we got a sweet 1951 files and 766 folders. Both Storm Call and Unrelenting Force is mentioned in the readme for IST, the sounds for them have been changed. The ESP only adds one entry, odd?.. AOS changed only a single value here - under "BNAM - Values" we got the value for "Priority" changed to 255 from the vanilla value 128. IST changes multiple values, though. First, it changes the conditions under "Conditions", Looks like this ESP swaps the conditons around (Comparison Value and Function). - "Frequency Shift" is changed to 75 from the vanilla value 0. - "Frequency Variance" is changed to 55 from the vanilla value 10. - "Static Attenuation" is changed to 8.81 from the vanilla value 3.52. - "Priority" is changed to 1 from the vanilla value 128. Looks like I got one little conflict already - I'd like to hear the distant thunder indoors and outdoors... Probably not easily fixed. Well, I know this post is somewhat large, but that's just the beginning of that little adventure... Guess I'm going to be testing groups of a few mods together, multiple times, figuring out what should be in a bash or merge, what needs patching and fixing, and what needs to be blocked in ASIS, INI files, Loadorder, etc.